We’re big fans of George R.R. Martin’s A Song of Ice and Fire series and the HBO show Game of Thrones that is based on it. GRRM is well known for his mouthwatering descriptions of food, and quite a few fans have attempted to re-create some of the dishes he describes. 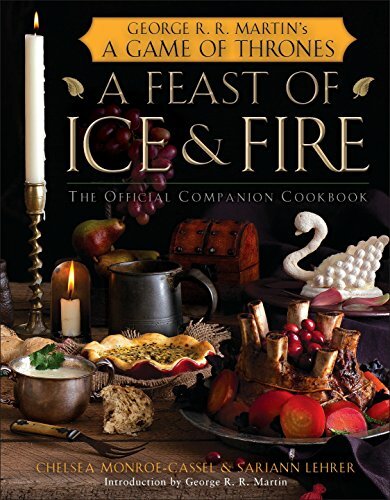 The best and most comprehensive of these efforts was at The Inn at the Crossroads, which used both medieval and modern recipes as inspiration to recreate the dishes described by GRRM. The bloggers were eventually asked to write the official companion cookbook for the show. Having tried and enjoyed several recipes from the blog, including the recipes for Sister’s Stew and the rack of lamb in garlic-herb crust, which both appear in the book as well, the cookbook has been on my wishlist for some time.